Guess what kids! The one and only Kira Small is coming back for a solo show at the tapps estate! Yes, it’s a Monday night, but what BETTER way to make your Monday a gajillion times better than rounding it off with some bonafide sweet soul?! You don’t believe me? Here, listen to this. Please either RSVP for the show on the facebook event, or contact me directly. thanks tina & her pony! what a great show by Tina & Her Pony! If you missed the show, here’s the recorded live stream. more photos and video will be posted soon! What the heck is “indie appalachian folk”? Well, come to the tapps estate on June 29th to hear for yourself! The next show features Tina & Her Pony, riding all the way from New Mexico to serenade us with great music. Doors open at 6pm, and the show starts promptly at 7pm. admission to the concert is a SUGGESTED DONATION of $10. With warm smiles and honest simplicity, Tina & Her Pony bring fresh life to old-time music. The charming duo adds a unique sound to the American folk tradition, featuring original songs that echo familiar melodies while creating new waves with radical, queer lyrics and uncommon instrumentation. 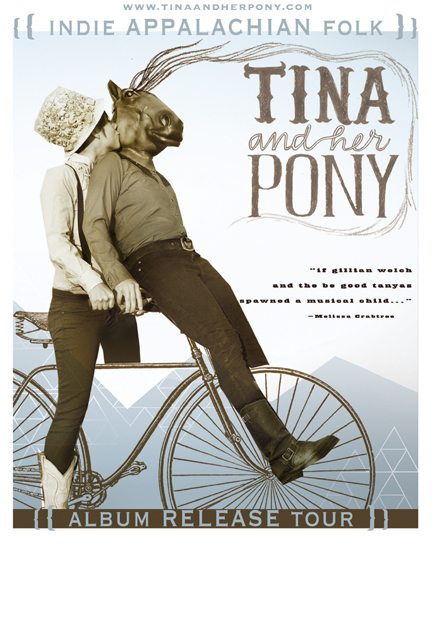 Tina & Her Pony formed in Asheville, N.C., in 2009 following the chance meeting of Tina Collins (tenor banjo, tenor ukulele, guitar, vocals) and Quetzal Jordan (cello, guitar, vocals). Collins and Jordan spent the last two years holed up in the high desert mountain town of Taos, N.M., making music and friends, and becoming one of the iconic artist colony’s most beloved performing acts. They draw inspiration from such artists as The Be Good Tanyas, Uncle Earl and Beirut, as well as the lush rivers and mountains that surround them. What a great show! Thanks to everyone for coming out to the tapps estate on a cold, cold night! If you missed the show, here’s the recorded video from friday. Come hear an Atlanta-based musician who will blow your mind with amazing music. The date is Friday, February 1st. Show starts promptly at 7:00pm. Doors open between 6-6:30pm. Kurt Scobie lives in Atlanta, GA, but he is most at home when he is on the road and meeting new people. Since 2008 he has performed over 400 shows, including three NACA showcases, and a performance for the Atlanta Braves. Kurt has also shared the stage with The Civil Wars, Matthew Perryman Jones, Montell Jordan, and Mike Kinnebrew. Influences such as Mat Kearney, Dave Matthews and Jason Mraz have helped Kurt create a sound that is winning over audiences across the country.